Assume I know how to properly ferment grain and distill it into whisky, and that I have all the necessary equipment. If I want a "sour mash" whisky, how would I go about it? From a bit of research, it seems that the term "sour mash" simply describes some sort of process where the distiller saves a bit of the old mash (maybe he/she "cultures" it somehow, to grow enough live yeast?) and adds it to a new batch to facilitate fermentation? Is there anyone familiar with the process who could describe how to apply it to an existing hypothetical small-batch whisky making operation? 1. Create an optimal environment for Lactobacillus. 2. Prevent spoiling organisms from producing foul aromatics and flavors. 3. Drop pH to produce desired amount of acidity/sourness. 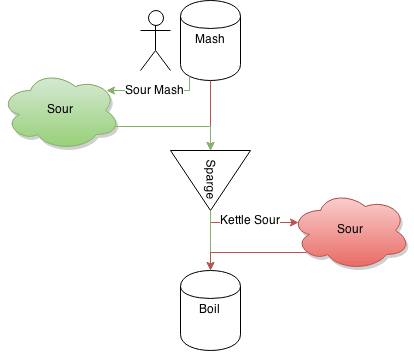 The main difference between sour mashing and kettle souring is that sour mashing occurs before sparging with the mashed grains still present while kettle souring occurs after sparging with the full pre-boil volume (and frequently in the boil kettle). Additionally, sour mashing will have a moderately higher gravity because it is undiluted first runnings. I assume the sour mashing aspect of this is what happens when distilling whiskey. In the sour mash process, the distillers beer is distilled, and a portion of the spent beer is added to the next batch. Many organic acids are not very volatile, so they will remain in the spent beer. Adding this to the sweet mash will add free amino nitrogen and organic acids to the sweet mash. Yeast likes a slightly acidic environment, and many bacteria and molds do not. Adding the spent beer help keep these spoilage organisms away while also adding nutrients to the mash. The spent beer also helps with flavor consistency. Not the answer you're looking for? Browse other questions tagged whiskey distillation or ask your own question. Difference between Whiskey and Bourbon? Whiskey: Year is it from distilled or bottled? Can whiskey be used to purify iffy water while out in the outdoors? What kind of whiskey is served cold? How to correctly drink whiskey? Zabaione - with Marsala or Whiskey? What can be substituted for whiskey with Haggis? What constitutes a “stack of whiskey”? Are there broad stylistic differences between Scotch and Irish whiskey?